Finally! An FO (finished object) to blog about and to show y'all! Yes, I've finally finished Manu! And let me tell you, I am SO bloody proud of this project. I honestly think this cardigan is the best thing I have made to date! Even before it was blocked I was putting on the cardigan every chance that I could, even though it was definitely too warm out to wear a garment made out of merino and alpaca. Brett laughs at me cause whenever he comes home from work he usually finds me wearing the cardie around the house, in denial that I'm sweating to death. I'm just über glad that Manu fits as well as it does, cause while knitting up the short rows I had tried on the cardie out of curiosity and had thought that it was a bit big and was wishing for a while there that I had made the XXS size instead. I was also a little worried about the length, thinking I had made it too short for my liking. In hindsight, I think I should have made it slightly shorter since alpaca is such a smooth and slippery fibre and tends to droop over time. I'm really hoping that it won't stretch too much in length though! The pattern calls for Sunday short rows, which I didn't do cause I couldn't be bothered with fiddling around with so many pieces of yarn. Not to mention that after reading project pages on Ravelry I found that the people that did the Sunday version ended up with unsightly holes and visible rows. Definitely not a look I wanted in my cardigan! So I decided to do the regular wrap & turn version instead. I used the amazing Cat Bordhi's technique of how to conceal the wraps for a more invisible look and not only is her way beyond easy, but you seriously cannot tell where the wraps/turns are! (Just) Jennifer asked me at the Friday knit night what's the difference between Cat Bordhi's way and the usual way, and really I couldn't say. All I know is that my previous efforts at short rows (the Hooters sweater, socks) have resulted in tiny holes. Cat Bordhi's way is amazingly flawless with nary a hole in sight. Curious as to how Cat does it? Check out her youtube video here. Oops! Don't mind that weird crease in the centre back. That's due to my poor blocking skills! Anyways, back to Manu. For me, the most intimidating thing about knitting this cardie? The pleats. I've never knitted them before and had no idea how they were done. Who knew that after knitting 24 of them that I would love knitting pleats? 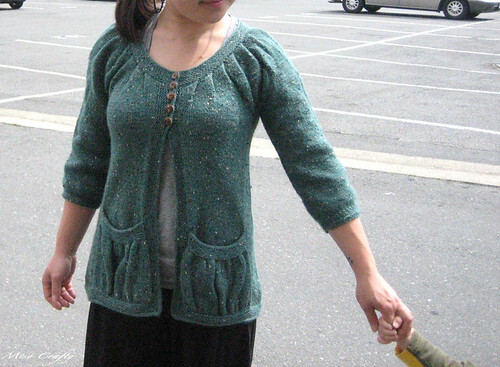 I would so knit this cardigan again just so that I could knit pleats again. They are that much fun and so bloody easy! I actually went on a quest to find patterns that have pleats in them, I am that obsessed with them! 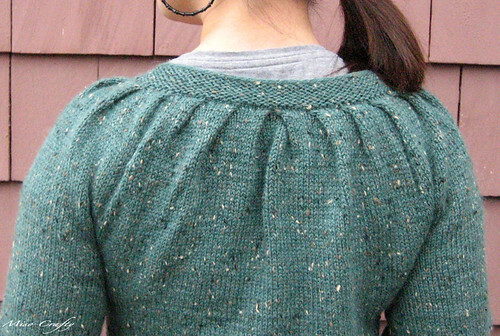 I would like to note though, that if I were to knit this again I would totally omit the purl row after knitting the pleats so that the pleats would look like they were coming straight out from the collar. You can't really tell in the photo, but to me the pleats look a little flattened next to the garter stitch. I'm totally being picky here but it doesn't make me love this project or this pattern any less. Throughout the entire project I did Russian joins when I started a new ball of yarn. Ever since Bonny taught/showed me this technique I've been absolutely hooked. It really does save time in the end and cuts down on one of my most dreaded finishing tasks: weaving in ends. About three quarters into this project I was starting to worry that I wasn't going to have enough yarn to finish. I wasn't keeping track of how many balls I was using up until I realized that I only had 2 balls left and I was halfway through the one I was working with. It might sound weird and crazy but I had an overwhelming sense of accomplishment when I finished my 6 rows of garter at the neck and had about a metre of yarn left. I was so smug with satisfaction that I didn't have to start a new ball when I only had a few stitches left to knit up. Is that just me, or does anyone else get that way too? Another thing that gave me sheer satisfaction? 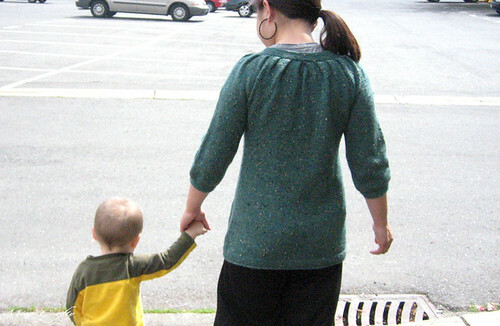 The i-cord edging. 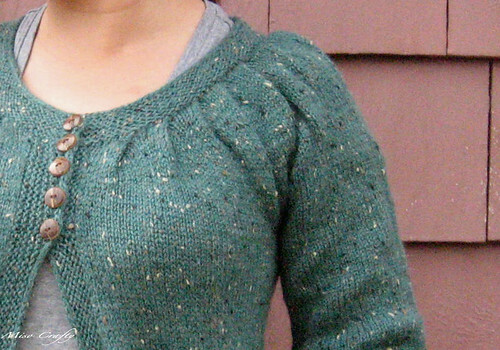 I didn't even mind having to pick up all those stitches around the entire cardigan edge. I knew that the fun of doing an i-cord bind off was right around the corner. I think I need to get out more! Let me also say that this cardigan knit up relatively quickly due to the fact that I was using my Knit Picks Interchangeable circulars set. I don't think I could've knit this project without it. At one point I had about 4 cables going on, all holding onto live stitches. I've most likely said it before, but I'll say it again: buying that Knit Picks needle set is THE best investment I have ever made for my knitting. I know a lot of knitters out there swear by Addis, and trust me, I love Addis as much as the next person but for the price point and quality, the KP set is the best. Pants down. It's lovely. I've never done pleats before, must try it....enjoy your new cardi! great cardigan! I have given up on knitting clothes for myself. They never seem to work out. From now on I am just sticking to beanies and scarves and gloves and hopefully a blanket one day too. Oh, your Manu turned out Perfect! It also fits you perfectly. I've taken the plunge and started on mine too but then I got a little side-tracked with Paper Dolls, the Totoro version. Have you seen that one on Ravelry...so cute. Thank you so much! Pleats are so easy! You must definitely give them a try! Don't give up! I've knit several things that just didn't work out, but I've learned A LOT in the process of it all. It's only now that my knitting is starting to work out for me! HA hahahah...get in line!! ;) But I'm glad you like it enough to want one of your own! Thank you so much!! I love all the Paper Dolls and the versions of it. That pattern is in my queue too, and now that I've done Manu I would love to give that one a try now too. It's just a matter of finding the right yarn for it. Good luck on your Manu! I'm sure it'll be wonderful too! !